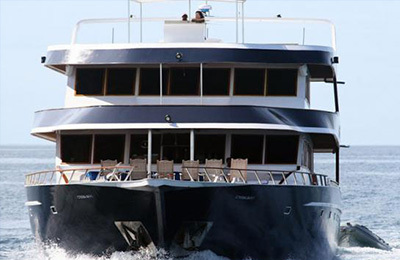 Kandooma Island Surf Resort - South, Male Guests overall rating: ★★★★★ 5 based on 5 reviews. 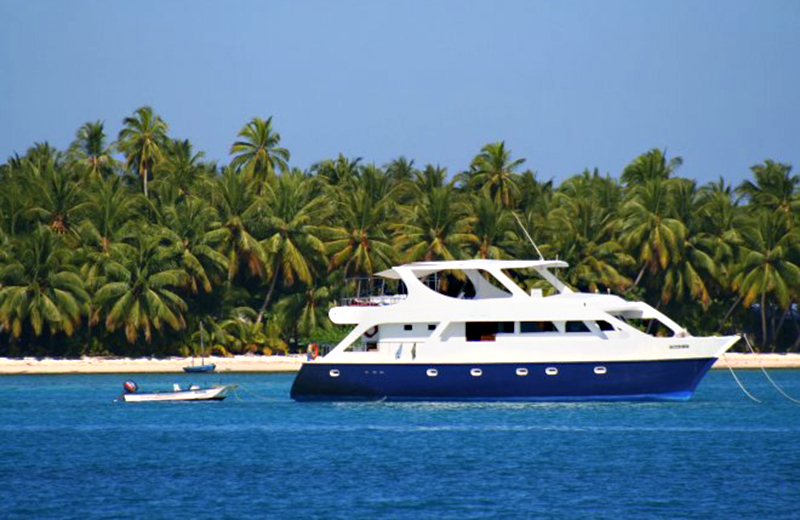 Kandooma Island is blessed with white sands, azure skies, lush tropical greenery and clear turquoise waters. To complement this, Kandooma Resort has created services intended to satisfy, engage, entertain, inform, educate and….. luxuriate. Kandooma Island is 13 hectares in area or roughly about a 20 minute walk around the perimeter. 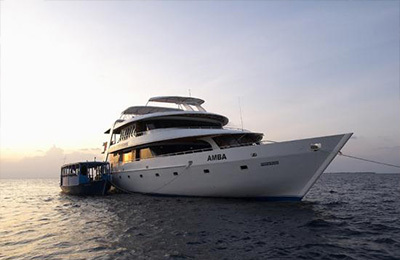 It is located only 45 minute speedboat ride from the capital Male. Kandooma has beautiful white sandy beaches around a third of the island for those with kids who love to play in beach sand; or those prefer working on their tans on the beach rather than on the sun loungers around the pool. With limited numbers at the resort, we can now guarantee that all surfers on Kandooma Island will be able to enjoy one of the best right handers in the Maldives uncrowded every day. We believe that there is no closer accommodation to take off zone in the world. You barely have to walk 30 metres from your villa to the paddle out point, and you literally lie in bed and watch the hollow and highly rippable waves peel down the point. Join us for an unforgettable experience to practice yoga at the resort, one of the world’s most breathtaking locations. Weave together the physical, emotional and spiritual aspects of your holiday to transcend you into complete wellness and relaxation! Kandooma Island Surf Resort has 160 villas in four different styles of beach and garden villas, beach houses, family villas and over water villas. Each villa type at the resort in Maldives has been designed with cool clean lines with white washed timber providing warm texture to the bare foot. Large picture windows mean that you are only a glance away from the great blue outdoors. The semi-detached beach villas come with large windows that positively invite the outdoors inside. Whitewashed floor boards evoke a sense of fresh coolness, yet feel warm and textured to bare feet. They feature light summer duvets and massive bath towels, flat screen televisions, a place to plug in your mp3/iPod, indoor out-door showers and wifi broadband. The sea-facing Beach House offers the luxury of space. Located at the water’s edge, the villas present a striking mix of natural elements and modern design. Bedrooms are on the first floor level and enjoy views of the sea. The living area underneath the bedroom is furnished with designer seating laid out on a carpet of fine white sand. As the name suggests, are ideal for families or a small group, and are the size of two beach houses together. They offer sleeping space upstairs as well as living and dining below. The Family Beach House is beautifully designed and will offer you complete relaxation during your stay. Just step outside the door and feel the warm white sand between your toes and at the end of the day retreat for the evening to enjoy the comfort of your living room. Because of the open design of this family beach house, you will be able to fully enjoy the view of beautiful Kandooma Island and the Indian Ocean at all times. Hovering above coral and marine life in the shallow clear waters, Water Villas offer the ultimate Maldives experience. Each Villa has a private sundeck with hammock that in high tide is partially submerged in crystal clear water. Expansive living space is complemented by a large open bathroom which offers a private outdoor shower and bathtub with views of the water. What is it like to surf Kandooma? Guaranteed Limited Limited Number of Surfers at the Resort! The breaks around Kandooma Resort have something for everyone from beginners that want to move to an intermediate level to experienced surfers wanting fast barrels and rippable walls. The surf instructor at Kandooma is a qualified instructor and can give basic tuition for beginners that have been surfing for a while, but want to progress to the next level. Experienced resident surf guides and a surf instructors on the island from 1st April – 31st October to look after all surfer guests on the island. However we have an instructor / guide on hand 12 months of the year for learn to surf and guiding in the off season. NOTE: To surf at Kandooma you MUST book a complete surf and accommodation package through Nomad Surfers. If you don’t have a surfer package, you will not be able to surf at Kandooma or take any surf transfers from the Island. If the swell is pumping up in North Male, it isn’t hard to get a group together that want to go. The guys bring their partners along and it is a full day out chasing waves, lots of fun. The surf guide will let you know when it is best to go and will organise the day trip with lunch included and beers on the way home. 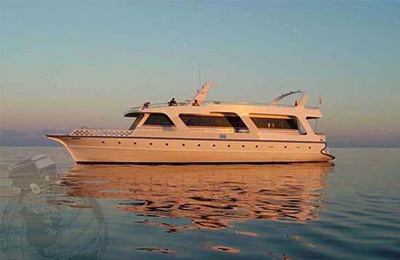 These trips however are subject to weather conditions and numbers required to run the trip. The surf guide will advise when and if the trip is possible. Join us for an unforgettable experience to practice yoga on Kandooma Island Surf Resort, one of the world’s most breathtaking locations. This vinyasa-style yoga class will weave together the physical, emotional and spiritual aspects of your holiday to transcend you into complete wellness and relaxation! Suitable for all levels: beginners, surfers, and seasoned practitioners, the yoga classes will leave you feeling ready to take on the day, or relax into your evening! Spa The idyllic setting at the Spa at Kandooma sets the scene of serenity and calm and is the perfect getaway from all the pressures and demands of today’s modern world. The spa experience at the Resort is all about energizing in a natural environment with its wide range of therapeutic massages and spa treatments in five treatment rooms with breathtaking oceanic views. Children will learn, create, engage, and learn about the fish, flora & fauna around the island, mix cakes, fancy dress……there is no end to the adventures! They have indoor and outdoor toys for the kids; painting, craft and kids movies etc and the staff are fantastic and will do face painting or play with them in the sand. They also have a small plastic climbing frame for the kids to play on which is just outside the door, as well as an air-conditioned room upstairs with game consoles for the older kids and there is a table tennis table as well. It is open from about 9am to 5.30pm and you can sign in kids aged 4+ for free, for as long as you want. If they are under 4 years old, then you have to pay a babysitting charge of about US$15 per hour. If you want babysitters at night, then they will come to your villa and it’s about US$15 per hour. The Dive Centre is comprehensively equipped to meet the needs of advanced divers but also suitable and thoughtfully set up for absolute beginners. ‘Dive Now Referral Form’ with PADI – which allows you to begin your dive adventure back home and complete the course with us. Bubblemaker – for children 8-10 years to experience scuba diving in pool-like conditions. Discover Scuba Diving – the first encounter with the wonders of marine life! PADI Scuba Diver – with 3 training dives in the lagoon, 2 boat dives to maximum 12 meters & 3 theory modules with advancement for a full certification. Open Water Dive – 5 training in the lagoon, 4 boat dives and 5 theory modules. Advanced Open Water Dive – an ideal hands-on experience in different areas of diving such as Night, Deep Drift, Fish ID, Wreck, Navigation and many more. Specialty Courses – Enriched air Nitrox, Digital UW Photography, UW Naturalist, Rescue Diver, Emergency First Response. Sitting in the Indian Ocean the Maldives are a group of coral islands straddling the equator southwest of India and west of Sri Lanka. There are about 1,200 islands and roughly 200 of those are inhabited. These low lying islands, isolated reefs and sand spits make up part of a larger formation of 26 atolls that formed around the edges of sunken volcanic peaks. Ring shaped and situated atop a submarine ridge that runs from north to south, the atolls cover an area of approximately 90, 000 square kilometers. The average size of the islands is only one to two kilometers in area and most are flat with white sandy beaches, crystal clear reefs and deep blue lagoons. They sit just 1.5 meters above sea level, and with the highest point being only 2.4 meters above sea level, the Maldives are considered the flattest country in the world. Male airport is an island just dedicated to the airport. Scheduled & charter flights: Qatar Airways, Martin Air, Condo, Eurofly, Lufthansa, LTU, Singapore airlines, Sri Lanka Airlines, Air Swiss, Air France, British Airways. The transfer is organized by the resort and has no extra fees. Just let the resort staff know your arrival details and you will be greeted at the Airport. Passports: To enter the Maldives, a passport valid for six months is required by all nationals. Tourist visas for 30 days are issued on arrival only, and are free of charge to all visitors in possession of valid travel documents. Note: Repair and/or replace costs apply if damaged. 1. Introduction to surfing in the lagoon (30 min) – Free of charge. Including board hire. Shared lesson. if you want to experience the magical ride that is surfing, then let us show you with our qualified surf instructors giving you a taste of what we believe is the best activity in the world. Including board hire. Shared lesson. Now you have a taste on the flat water and want to get that slice of magic and stand on your first wave. We make sure you get the opportunity, in a safe and supervised environment. Please note that having a pre-purchased surf pass is essential. Including board hire. Shared lesson. For the experienced surfer who needs someone on one expert tutorial from our experienced surf instructor. You might find the smallest tip makes the biggest difference. Includes analysis and debrief. Please note that having a pre-purchased surf pass is essential. Exclusive training with our best surf instructor. The smallest tip can make the biggest difference. Please note that having a pre-purchased surf pass is essential. US$110 p/p + a surf pass. "Me and my husband went here on our honeymoon and it was perfect! The staff, the room, the food and the beaches. Just lovely! I would recommend all inclusive as the prices in the Maldives are quite high. Make sure to visit the rooftop bar in the sunset and go snorkeling." "We stayed in 43/44 Beach Two Bedrooms Villa from 9 13 March 2017. The Villa is huge with plenty of spaces. First floor is the living room with open space for the kids to play sand castle. Upstairs are two huge room with its own toilet and outdoor shower. Our 3 young children enjoyed every part of this big villa. Beach & Island **************** It comes with beautiful beach and clear water where you can see fish swimming, spotted small shark and sting rays as well. There is a local island just Opp, and you may spot local children playing in nearby opp beach. Food ******* Food is excellent with choices of Asian cuisine and western ... do try the local Maldivian dishes, price is USD15 30 average. We enjoyed the free kids meals too, good choices and kids are well taken care of here! Kids Club *********** Kids spending many hours there daily, enjoyed the team's superb service and keeping the kids occupied through out the day. Thank you to everyone in the resort, from restaurant, reception, kids club .... Provided the best service and everyone is so friendly." "My family and I had the pleasure to stay a week in this lovely resort where we found courteousness from all the staff of the island. Great place either for children and adults due to the possibility to organize several activities. Our room was beach front and its size more than desirable. Clean and aired, we really liked it. Highly recommended." "We have just returned from a fantastic holiday where we stayed in an over water villa (no. 59) 4 11 February. The villa was light and spacy and the hammock on the terrasse was the best place to relax and look at fish, our kids loved it (so did we). We had positive experiences with all aspects of the resort from the good atmosphere in the kids club to good food in the restaurants and experienced diving instructors in the diving center. We have never met so kind employees at other resorts. Everybody seemed to do so much for us and were especially kind to our kids aged 2 and 6. The surroundings of the resort was absolutely paradise the water had the most amazing color, there were lots of fish in the water and one of the best places to dive was just next to the resort. We decided to renew our vows, and had an amazing experience with this as well something we can definitely recommend! The photographer took really beautiful pictures and we now have a gorgeous photobook with memories. We hope to get the chance to come back again in the future." "Loved my stay! Everything was perfect! Service is beyond words! Everyone really friendly and ready to help out. Very clean, organized. Great surf, great food, amazing breakfast spread! Snorkelling is just the most incredible experience! Just paradise!! I would go back any time!!"